Your mouth just watered, didn’t it? 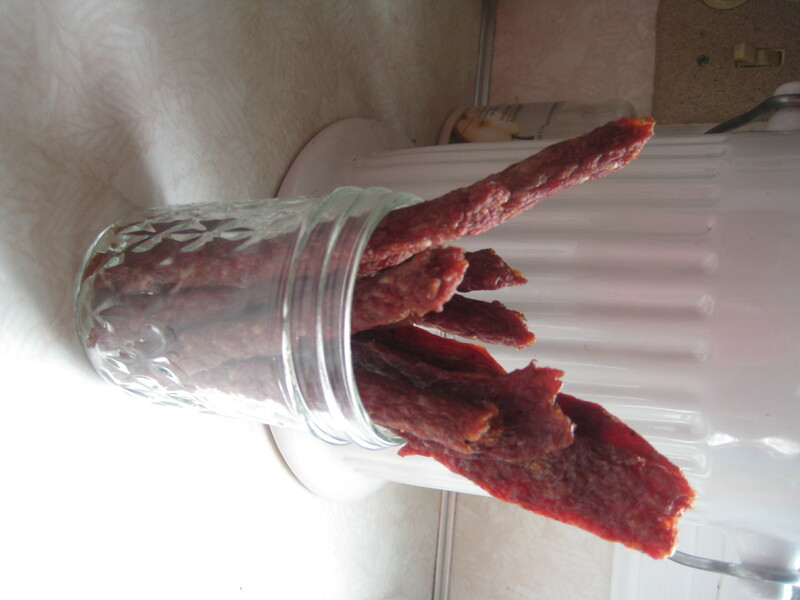 Saturday, my Dad offered me a piece of store-bought bacon jerky and changed my life. Bacon, any time of the day? 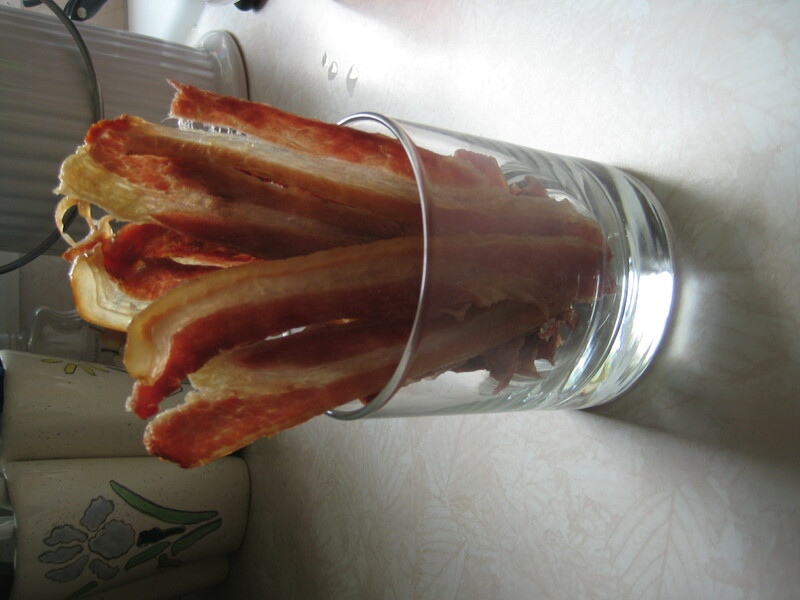 Bacon you could eat without getting your hands (too) greasy? Well, okay! This bacon came from an impulse buy at the IGA a few months ago. It was like 14lbs for $10.00, or something ridiculous, and naturally, you get what you pay for. This is terrible bacon. 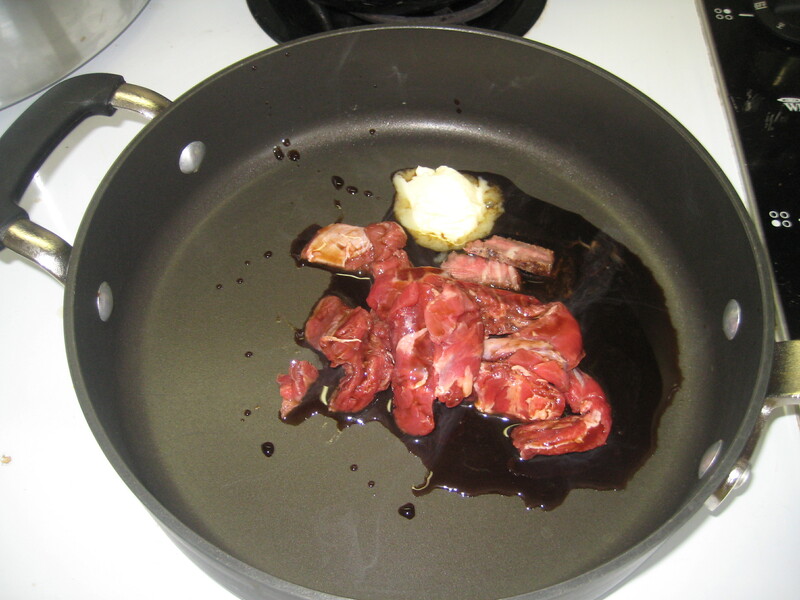 I hate cooking it because it makes my house smell like some strange chemical, not delicious bacon. As you can see from the above picture, it’s also really fatty, and looks more like ham than bacon. Anyway, I though “Hey! Maybe it will taste good like this!” So I trimmed off all the excess fat, and diced all of the smaller pieces into bacon bits. 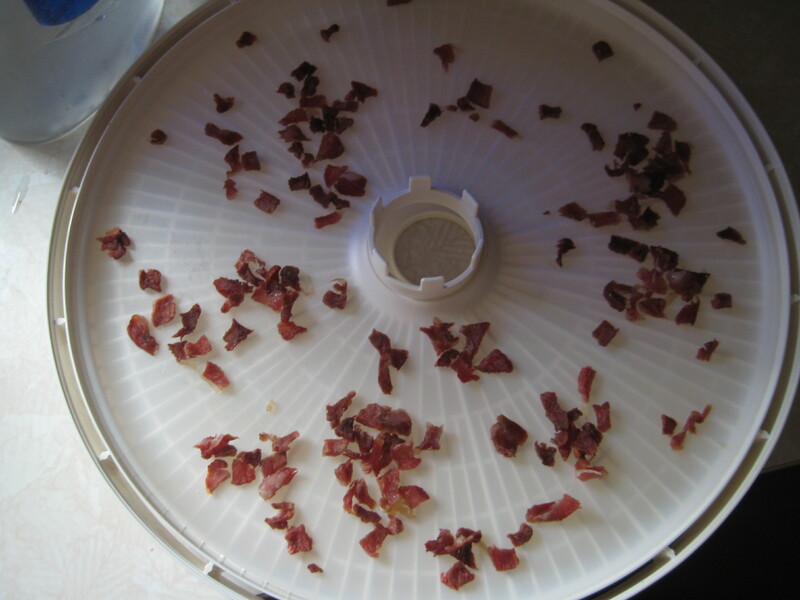 You’ll need a fruit leather tray for bacon bits, so they won’t fall through the grid. Turn the dehydrator on the hottest setting, and check back in 2-3 hours! I actually over-dried mine slightly. I think they would have been a little chewier a half an hour prior to when I remembered them. The bacon bits turned out really good though. This is a total game changer! 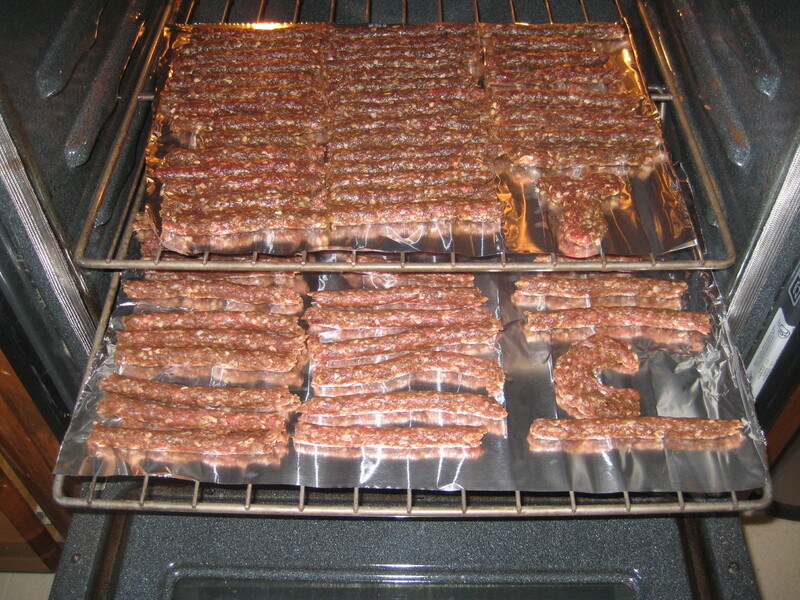 I can’t believe I never thought to make bacon jerky before! I’m definitely going to do this again soon with some GOOD bacon, because the underlying chemical taste was still present, unfortunately. I recommend starting with good bacon, and not cheap discount boxed bacon that you have to sort into 1-lb increments. Go figure. And both of my children loved it, so that’s a huge score to have a handy protein snack on hand for them. 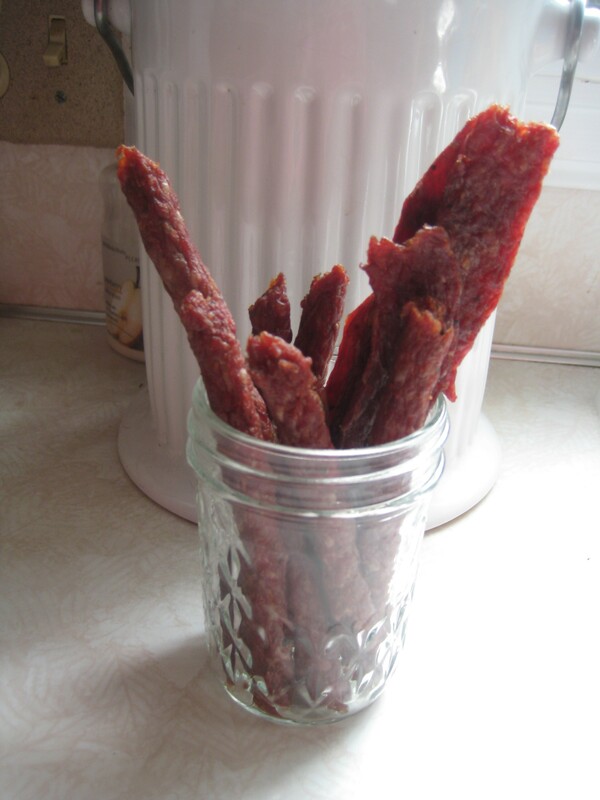 Note: While I think it’s probably fine to leave the bacon jerky out on the counter in a baggie or jar since most bacon is cured with preservatives, I have been keeping mine in the refrigerator and it has not affected it’s quality or texture. 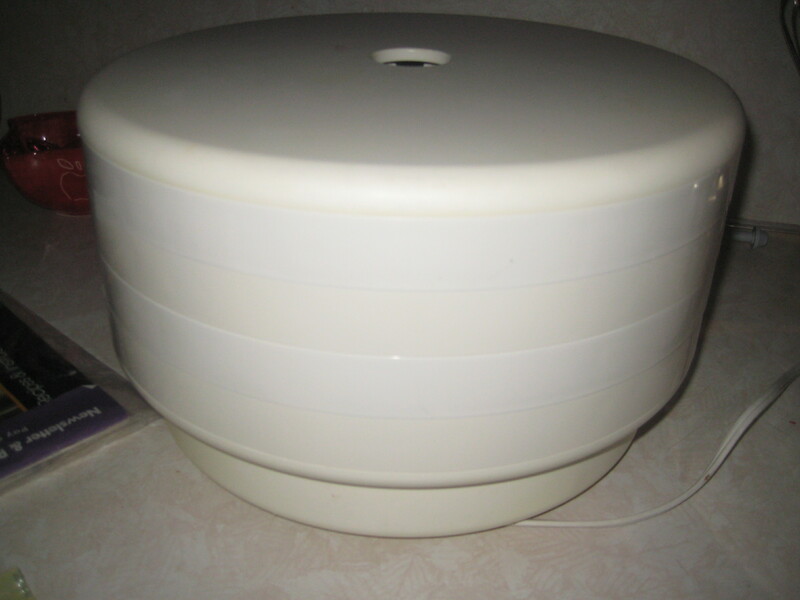 A Dehydrator, I have my Mom’s 20-year-old American Harvest Snackmaster, and it works like it was purchased yesterday. 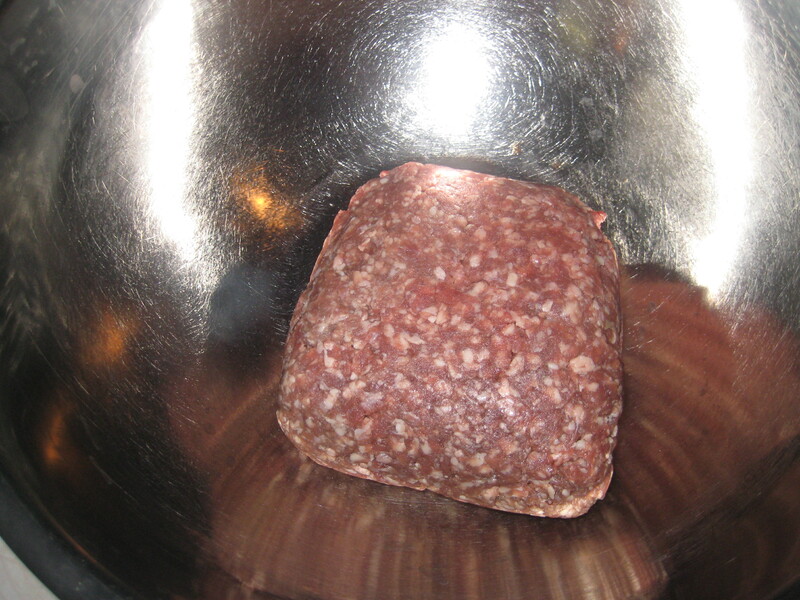 Mix the spice pack and cure into the ground beef. 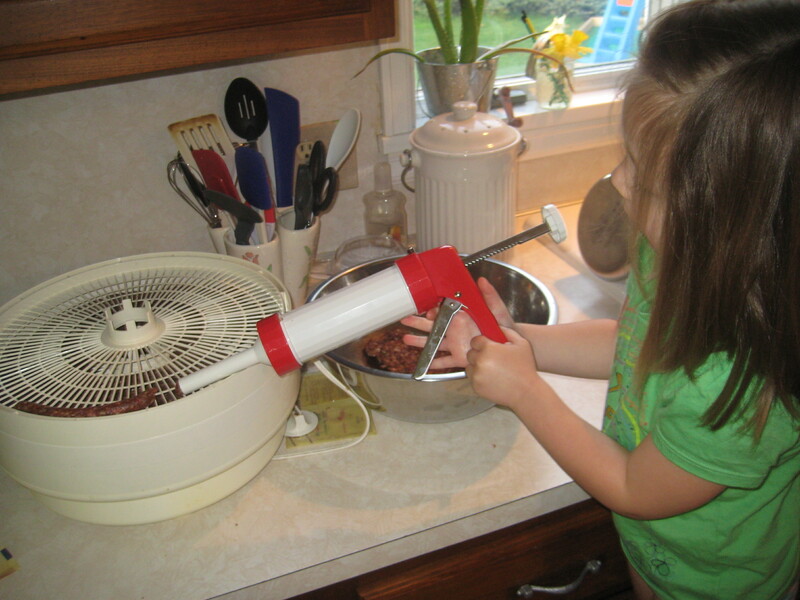 If you’re like me, you’ll have a 4-year-old hovering over your shoulder asking to help, and when you offer to let her mash her fingers in there, she’ll stare at you like you’re insane so you’ll end up being the only one in the kitchen with dirty hands. Once the spices and cure are all mixed in, you’re ready to load your gun! 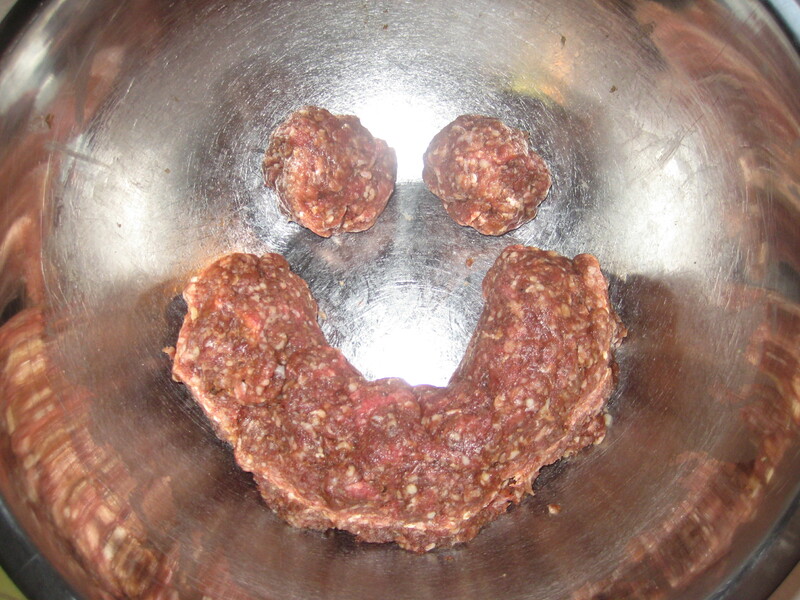 Aww, even the beef is excited to become jerky! You can fit about 1/4 lb into the gun at a time, or you can be smart and invest in a bigger gun which claims to hold a whole lb of ground meat. I wasn’t smart enough to get the big gun, and I let my daughter help, so it took about 4 times as longer than needed to prep the trays with strips . 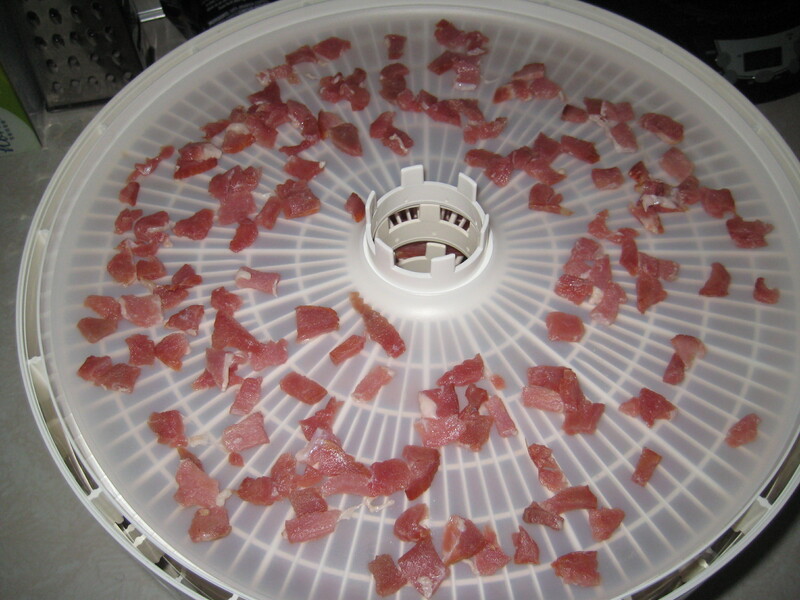 Once your trays are loaded, set your dehydrator to the “meat” setting. On mine it’s the highest setting, at 145 degrees. Now we wait. Let me tell you, women: if you are trying to entice a man, invite him over when you’re making beef jerky. He will walk into your house and propose right then and there, it smells that good! My husband practically renews his vows every time I make it. Back to the jerky. 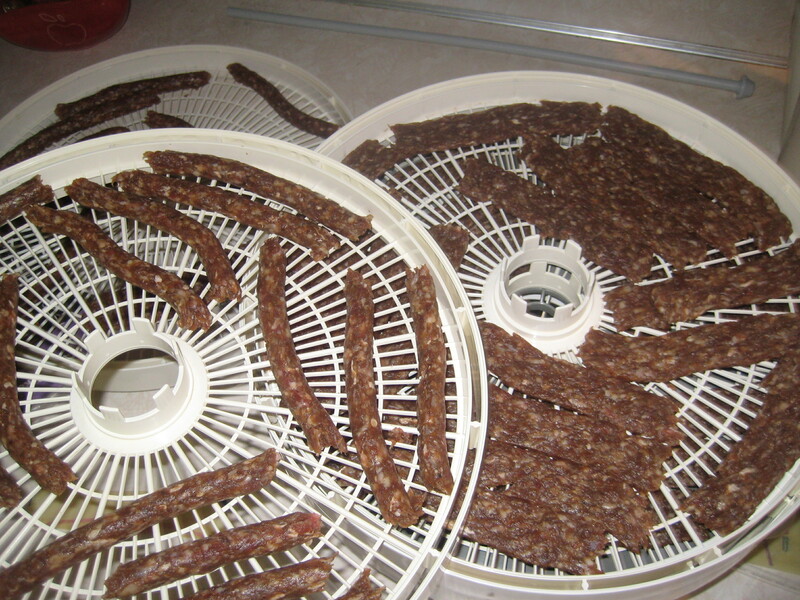 Depending on how full your trays are and the humidity, it takes about 4-8 hours for the jerky to dry. 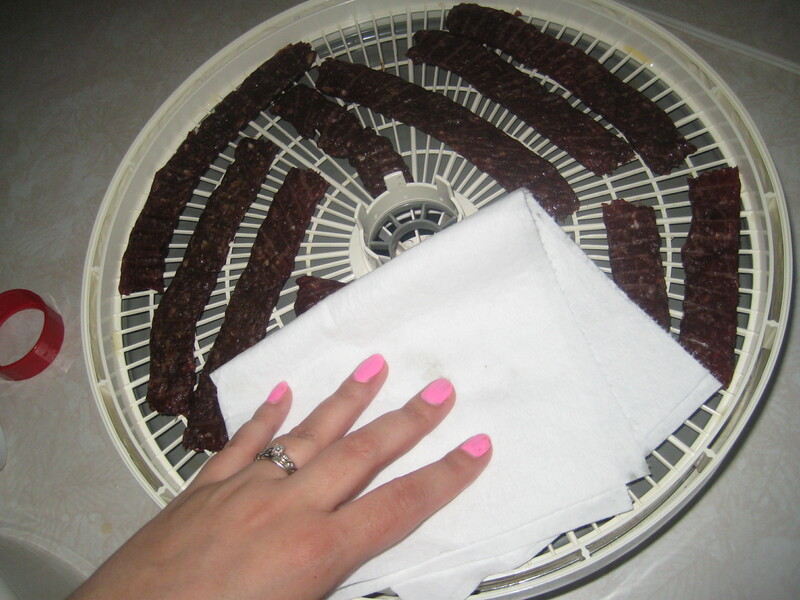 Every 1-2 hours, turn off the dehydrator, blot the pieces of jerky with a paper towel to soak up the grease, and flip them. They’ll start turning dark and will shrivel a little. Once you start suspecting they’re done, tear one in half. If the inside is still wet, “glistening” or pink, they’re not done. If the inside is the same color as the outside, take a big bite and pat yourself on the back. They’re done! Now pull all the pieces off, wrap them in a few paper towels and let them sit on the counter while you do the dishes and clean your trays. After 30 minutes or so, they’re ready for storage. You can leave them out on the counter in a container or Ziploc bag if you know you’re going to inhale them (or are having a football party or something), or you can keep them in the fridge if you want them to last a little longer. I keep mine in the fridge and they taste just fine cold. 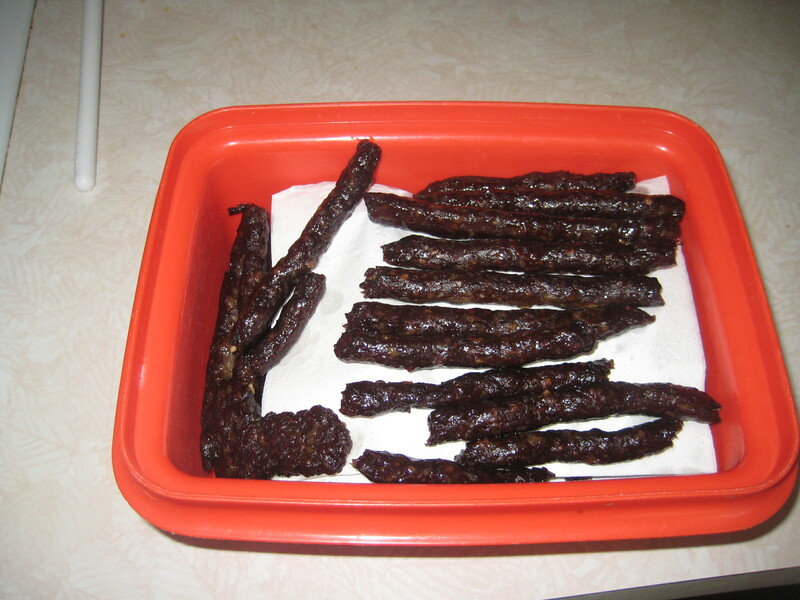 The first time I made jerky, I used ground turkey. It turned out delicious! I did not realize, however, that the gun disassembles as much as it does. 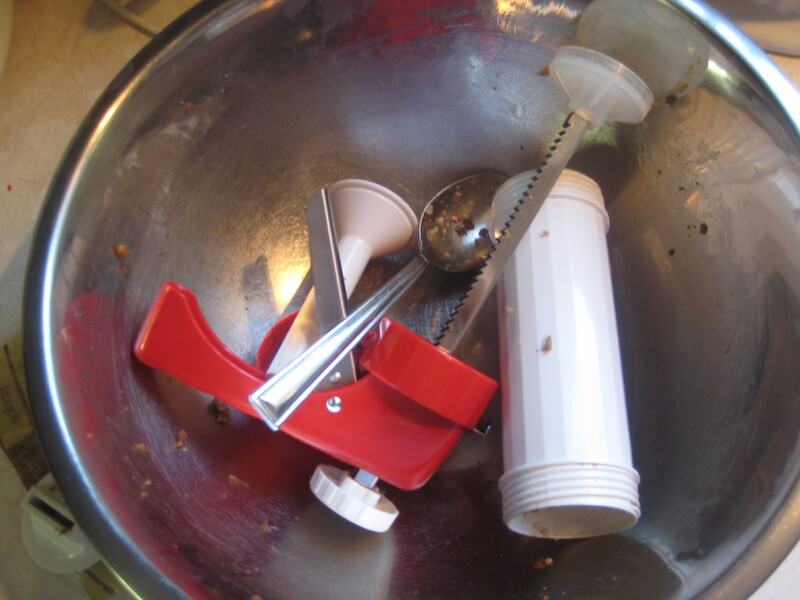 I thought, “Wow, this thing is really hard to clean” and went about my merry way. 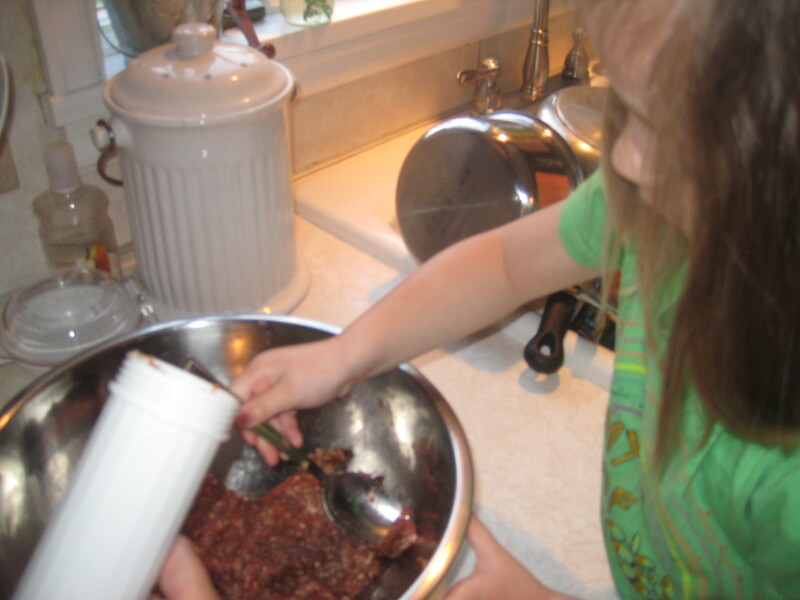 The next time I made jerky, I made venison jerky that we never got to try because I discovered, after wondering what that smell was the whole time, rancid turkey trapped behind the plastic thing. Duh! The white tube unscrews! So don’t be a Chelsea. Unscrew the white thing and WASH THOROUGHLY. Otherwise you will have to waste venison jerky, and that will make you cry. I’m going to do a test here. 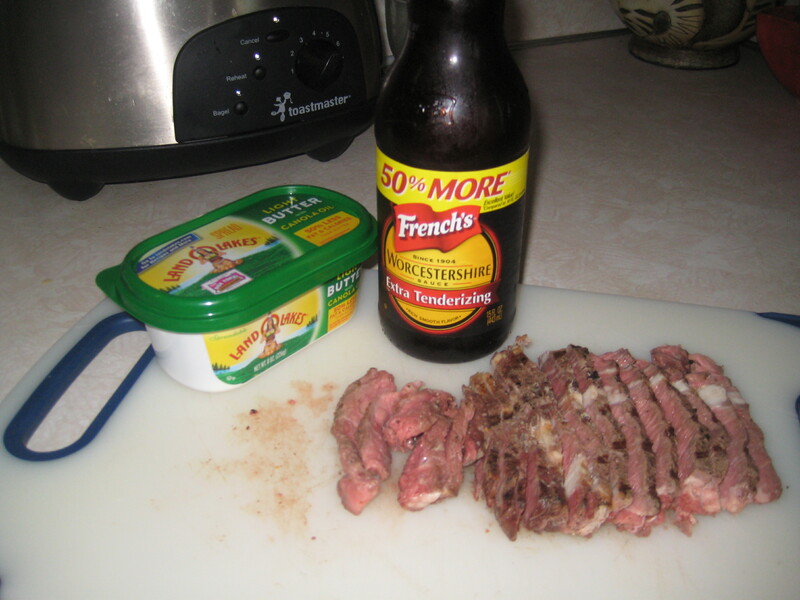 I’m going to use one of my spice packs for 1 lb of the beef, and the recipe above for the other lb. 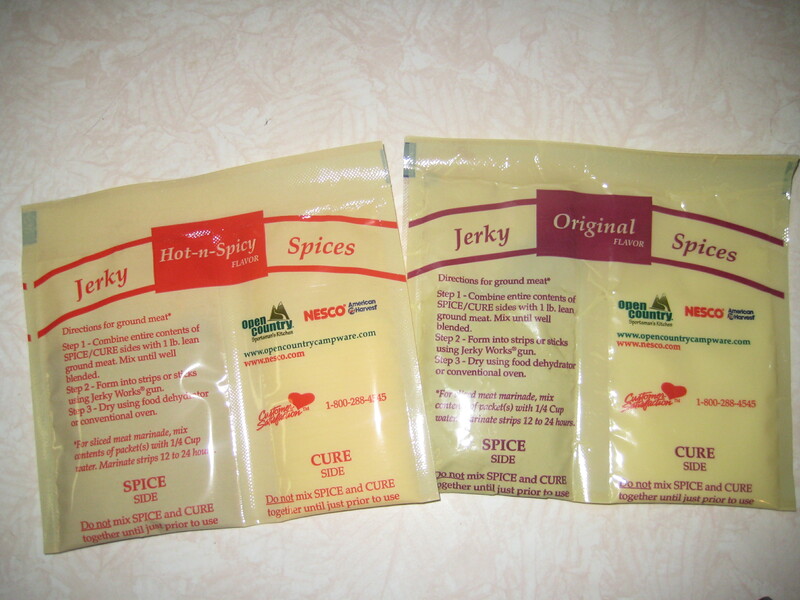 At the end I’ll let you know my verdict on which spices make the best jerky (Nesco’s premade pack, or homemade spices), and which method of drying makes the best jerky (a dehydrator or an oven). You’re pretty much going to follow the same steps as above, substituting dehydrator racks with oven racks. I wrapped my oven racks in aluminum foil to give the jerky some security. They were afraid of falling between the racks to certain doom. One con I noticed right away with the oven method is that it offers me less space. I was going to do my usual “flat for original spices, long for the test spices”, but discovered immediately that I didn’t have enough room. So I used the long attachment on my gun for both flavors, but made the last bit into a “T” for “test” and a “C” for “control”, or the original spices. It was kind of funny, because my husband, came in and laughed when he saw the T and the C because he thought they were for “Ty” and “Chelsea”. I decided to play it safe and closed my oven completely. I checked it every hour, turning the pieces and blotting with a paper towel like you would with a dehydrator. It needed it! The foil on the racks collected a lot of the grease. I also rotated the racks every hour because I do have an electric oven and I know from experience (mostly bad experiences) that it cooks unevenly. 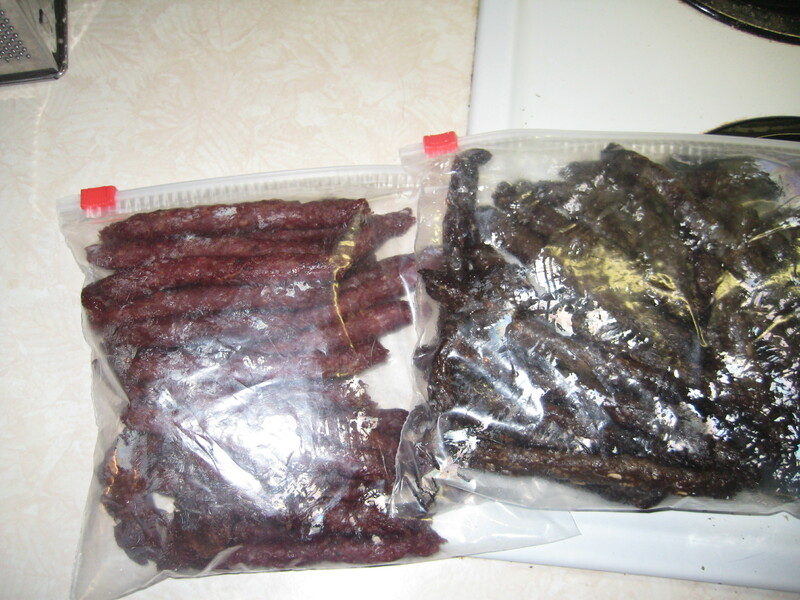 It took about 6 hours at 170 degrees for the jerky to dry. The same amount of beef took about 4 hours in the dehydrator at only 145 degrees. Again, when you break open a piece and it’s no longer moist inside, it’s done. Layer the pieces in paper towels and set them out for a little while so the grease will absorb. I had to hide mine in the microwave because of all the furry thieves in my house. My spice packs I’ve used for years will kill you. 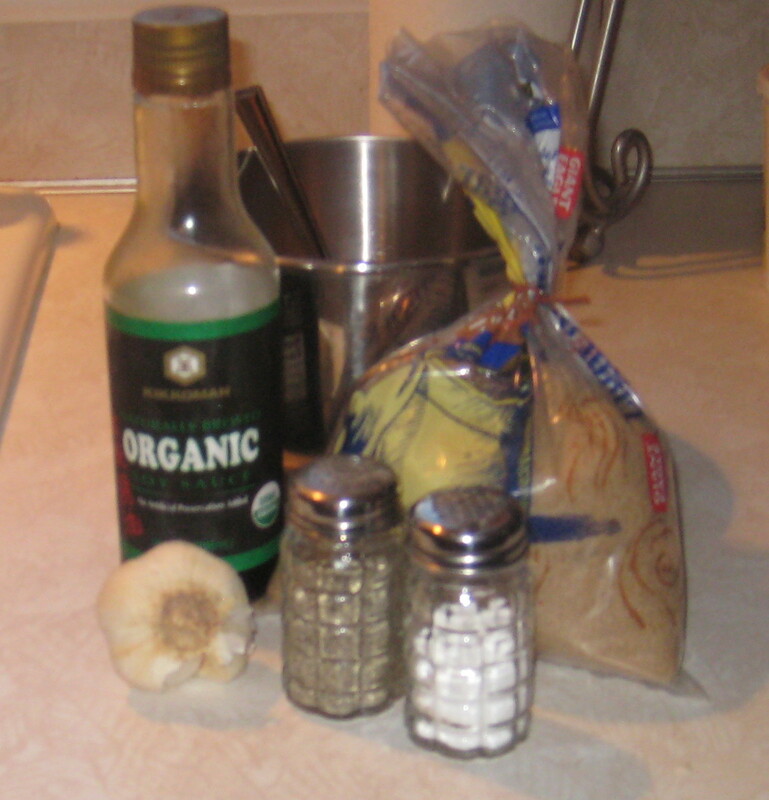 I never thought to look at the ingredients at the beginning of this post, because that’s something I started doing recently and I’m not totally in the habit yet. But while searching the internet for a good recipe for ground beef jerky (there’s a lot of recipes for marinades for sliced beef jerky, not a whole lot for ground beef), it occurred to me that I never read those ingredients. Sure enough, the spice pack is laced with MSG and nitrites, which according to a friend of mine who reads all that stuff, will kill you. Well, I can’t think of any pros to using the oven. 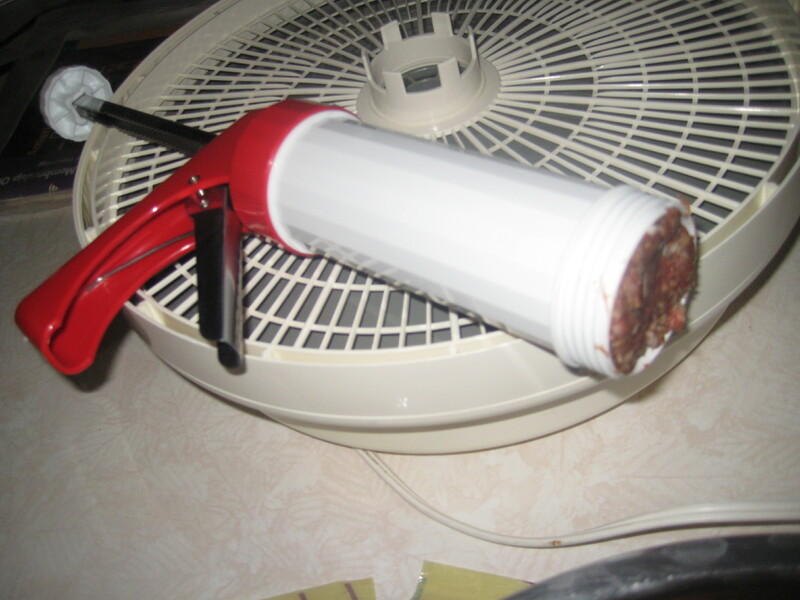 If you don’t own a dehydrator and an oven is your only choice, then at least you can still make jerky. 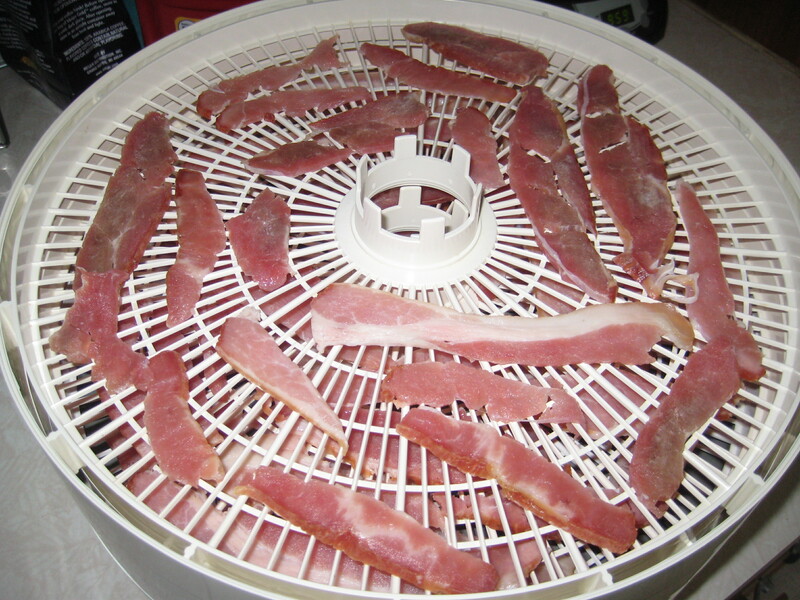 But a dehydrator is definitely a good investment if you plan to do a lot of dehydrating. 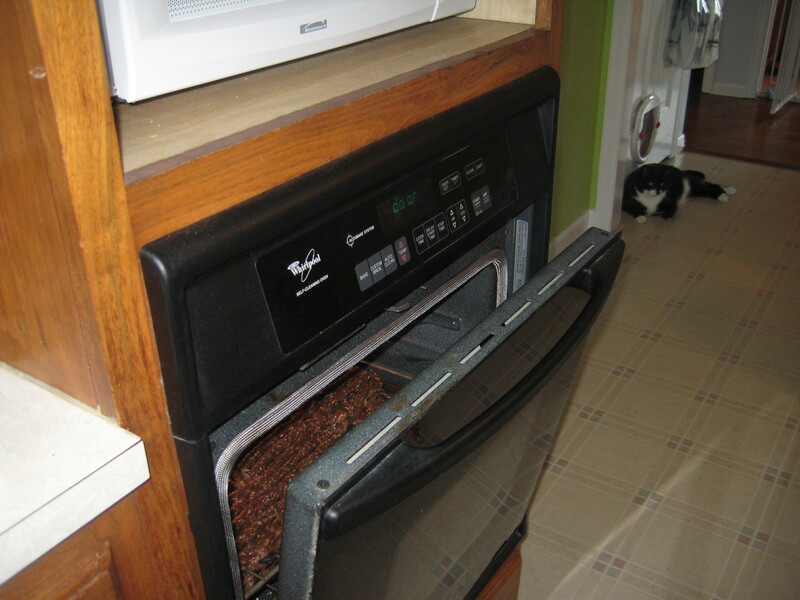 The oven took 2 hours longer, had less space, and while the jerky tastes fine, it is not as savory. 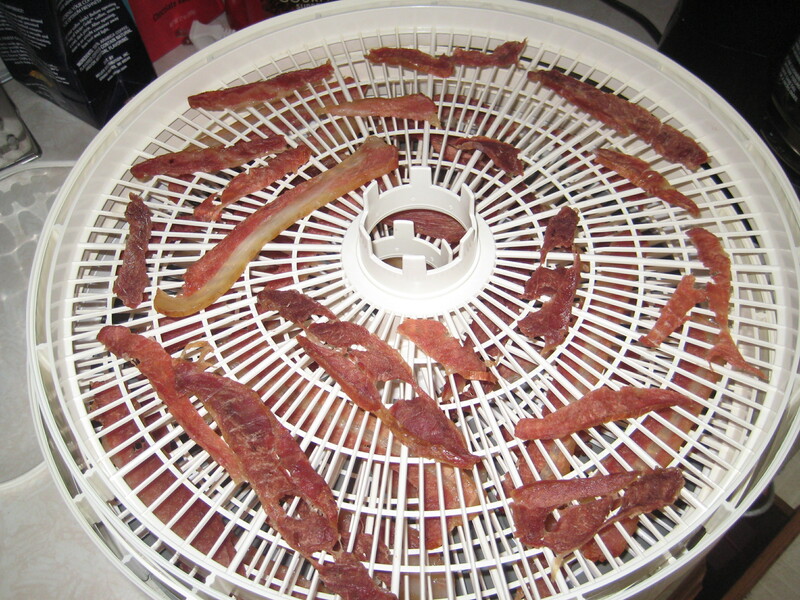 (I do not deny the fact that the extra work I put into using the oven may be tainting my opinion of oven jerky…) A dehydrator takes all the mystery out of dehydrating, too. 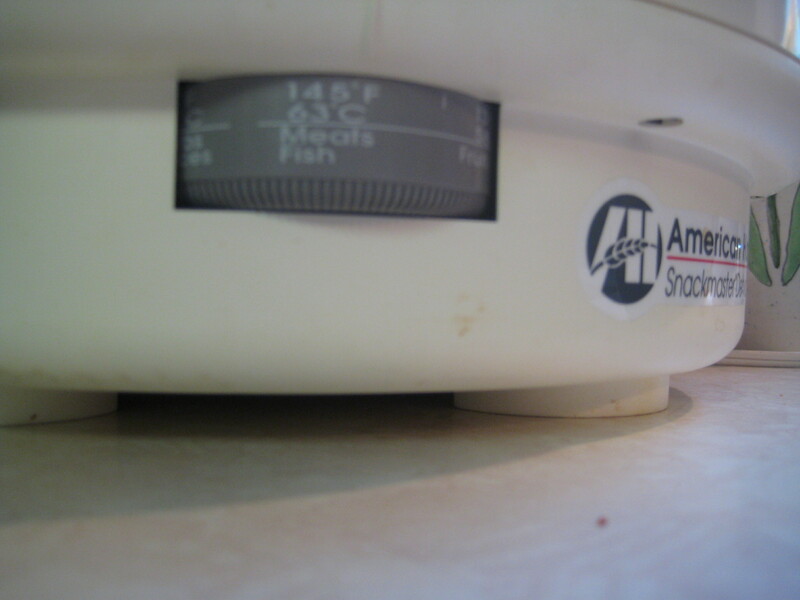 You prepare the food, put it on the trays, turn it on, check back every now and then. With the oven, I think laying foil on the racks may have added to the time it took to dry the jerky, and it was kind of a pain to have to switch the racks every hour. So my official recommendation is to go scour your mother’s basements and steal her unused dehydrator. Truthfully, the jerky with the Spice Pack of Death tasted a little better. Perhaps because I’m more used to it, but also perhaps because it also turned out a lovely shade of red whereas the homemade spiced jerky just looks like commercial jerky. 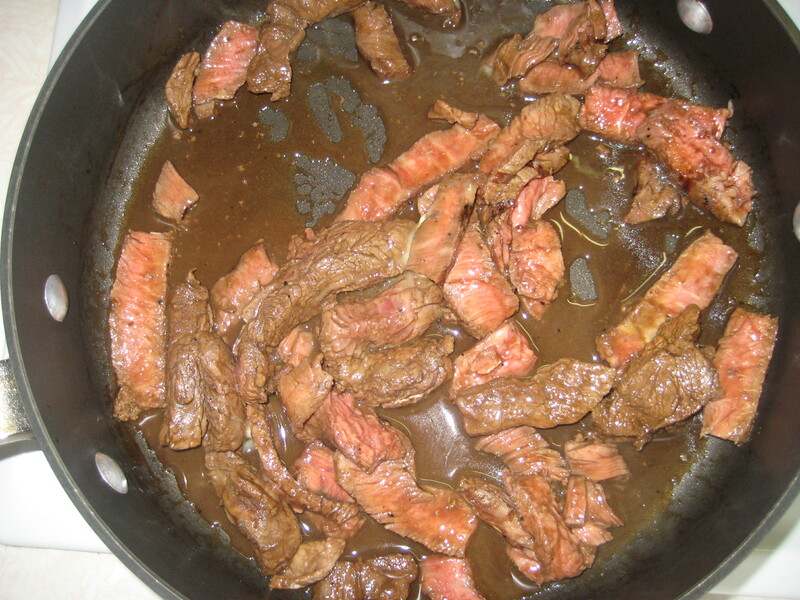 (You can kind of tell from the above picture) I think the next time I make jerky, I’ll play around with that homemade recipe some more and add paprika, onion powder and maybe a little curry too. Ty really likes the homemade spiced jerky, though, so I would definitely recommend trying it over buying the spice packs! Well that is all for today! In the time it took me to make 4 lbs of beef jerky we’ve already consumed 1 1/2 lbs of it, and I cannot stress enough on how delicious it is!